I had great fun living the life of a mail-order bride. Vicariously, that is, through the harrowing, humorous, and heart-warming experiences of Kat Sinclair and her sister Nell. Two sisters, two missing misters, and a shocking welcome to the Wild West. What pulls you and I toward such an outrageous scenario as a woman leaving what she knows to step into the unknown with a man she doesn’t know? Mail-order brides represent a stalwart breed of women who exude courage, strength, and a sense of adventure. They are women seeking a new beginning, opportunities, and financial security. We gravitate toward these stories because we like meeting a gutsy woman, young or old, who has a need to be married, but doesn’t have any promising prospects in her current circumstances. Their moxie might inspire us, but we’d happily do without the desperation that drives many of them west. Usually, the heroine is connected to a possible mate through a response to some sort of advertisement. Wanted: A single woman who is willing to walk away from the life she knows to travel across the country or even around the world and marry a stranger. She must be willing to bear his children and take care of their home, all while causing him to grow in his affection for her. The mail-order bride plot line is typically one in which a man living in a western country, most commonly out west in the United States, marries a woman from a depressed or oppressed country or from the male-deprived eastern United States, sight unseen. Personal advertisements for matrimony served as the link between mail-order brides and the men who sent for them. The fellow placing the ad or responding to an ad may end up being the one the heroine marries, but what if he isn’t? What if he isn’t who he is purported to be? Or maybe it’s the heroine who wears a façade. If so, why? And where does the misleading and misgivings take the characters? 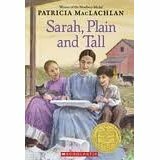 I loved finding that out in Stephen Bly’s Code of the West book, It’s Your Misfortune and None of My Own. .
Sarah, Plain and Tall by Patricia MacLachlan is one of the most popular examples using the mail-order bride scenarios in fiction. Papa lost his wife and placed an ad in the newspaper. Easterner Sarah Elizabeth Wheaton responded, setting her adventure in the west with the widower and his two children in motion. The classic tale began as a children’s novel and emerged as a popular Hallmark television movie. While the mail-order bride storyline is most commonly seen in historical fiction, the 1993 movie, “Sleepless in Seattle,” offered a contemporary twist on the classic story form. A motherless boy desperate to help his father find a new wife called into a radio show and told his father’s story of loss and loneliness. Letters flooded his father’s mailbox opening the door to a compelling and heart-warming romance. 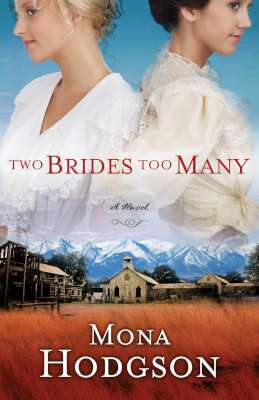 In Two Brides Too Many, two of four Sinclair sisters travel west and arrive at the depot in Cripple Creek, Colorado expecting to meet the men with whom they’d corresponded. But when the ladies disembark at the train depot, neither fiance’ awaits them. The well-bred Sinclair sisters find themselves alone in the wild, frontier town—a place where fire threatens to reduce the buildings to rubble, the working women strut the streets, rogues will gamble for the shoes on one’s feet, and grace is found among the most unlikely of folks. 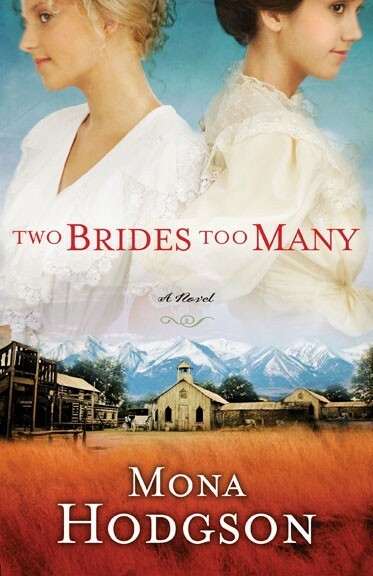 If you share my delight in mail-order bride stories with a twist, I hope you’ll ask your favorite bookseller for a copy of Two Brides Too Many. Do you have a favorite Mail-Order Bride story? Denver and Colorado Springs were popular towns in Colorado Territory, and have remained so since Colorado received statehood in 1876. Although Cripple Creek is often overlooked, the gold mining camp’s footprint is deep and widespread in Colorado’s historical soil. Cripple Creek, nestled in a saddle valley on the southwestern slopes of Pikes Peak, became a booming gold mining camp in the 1890’s. At an elevation of nearly 10,000 feet, just below timberline, the city’s history is one of highs and lows with fires, disease, outlaws, Indian wars, labor wars, and prostitution. Here’s a peek at the Cripple Creek that inspired me as I wrote The Sinclair Sisters of Cripple Creek Series. Tens of thousands of men (and women) flocked to the rocky mountains of Colorado seeking gold. Between 1890 and 1910 more than 22,000,000 ounces of gold were extracted from 500 mines in the Cripple Creek District, mainly Cripple Creek and the neighboring town of Victor. The Cripple Creek District produced more than thirty millionaires. Many influential women made history in Cripple Creek. I feature and fictionalize at least of those women in each of the Sinclair sisters books. You’ll find more about them in future posts. By the time the 1800’s game to a close, Cripple Creek had become a cultural destination, drawing the upper tens of Denver and Colorado Springs to its opera houses and ice cream parlors. This rowdy but charming mountain home of The Sinclair Sisters of Cripple Creek now houses several engaging museums, including the Cripple Creek District Museum, Pikes Peak Heritage Center, Outlaws & Lawmen Jail Museum, and the Old Homestead Parlour Museum. The last full weekend of June each year, Cripple Creek pays homage to its historical, mining heritage in the Donkey Derby Days Festival. Bob and I participated this year. More about that in a future post. I hope you’ll spend time in my fictional town of Cripple Creek with Kat, Nell, Ida, and Vivian Sinclair in The Sinclair Sisters of Cripple Creek Series, and plan to visit the historic Cripple Creek one day soon. Twenty-two years ago, Bob and I went with my folks to Colorado. One of the highlights of the trip was our time at The Flying W Ranch in Colorado Springs. The Old West town setting, the cowboy grub, and the western show was a feast for the eyes, the stomach, and the heart. My dad’s joy was infectious as his whole rocked with explosive laughter and tears ran down his face. Priceless memories. While laying out our Road Trip Book Tour for The Bride Wore Blue, I decided Bob and I were past due for a return to The Flying W. When I let the owner, Terry Wolfe, know about my Sinclair Sisters of Cripple Creek series of historical novels and my upcoming trip to Colorado Springs, she welcomed the opportunity to host a book signing at the ranch. 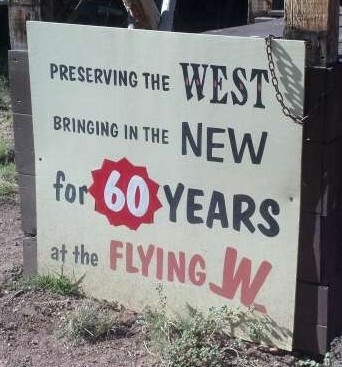 On Saturday, June 16th, Bob and I returned to the Flying W Ranch in Old West costumes. Terry met us at the gate and walked us through the recreated western town to the Cowboy Shop, ushering in another fabulous evening at The Flying W Ranch. My marketing and publicity team from WaterBrook Press (publisher of my historical fiction) joined me for the book signing and the chuckwagon supper and western show. As the wranglers stepped onto the stage, new strains of laughter mingled with the old in an evening brimming with new memories. Days later, I was in Cripple Creek, poised to participate in Donkey Derby Days events, when I received word from my editor in Colorado Springs that the Waldo Canyon Fire had consumed The Flying W Ranch. My heart ached for the families whose loved ones passed, for the more than 300 families who had lost their homes, for Terry Wolfe and her Flying W Ranch family, and for all who suffered in the path of the Waldo Canyon fire. 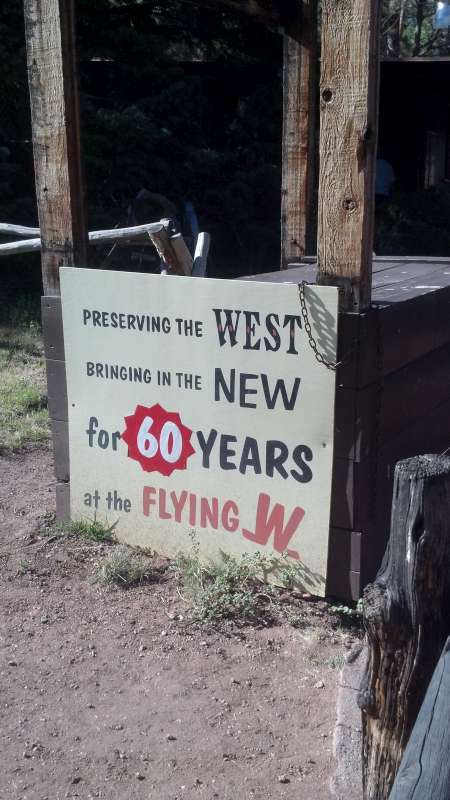 Imagine my excitement when I learned of the plans to rebuild The Flying W Ranch. I’m already looking forward to our next visit. The pioneer spirit of Colorado lives on. Just like the people of Cripple Creek who rebuilt their town after the devastating fires of 1896, the folks of Colorado Springs are moving forward…rebuilding. Many readers of The Sinclair Sisters of Cripple Creek series assume I live in Cripple Creek or at least in Colorado. When they learn I live in Arizona, they invariably have questions. In Arizona, I live at the base of Mingus Mountain, home to the most vertical town in the United States—Jerome. 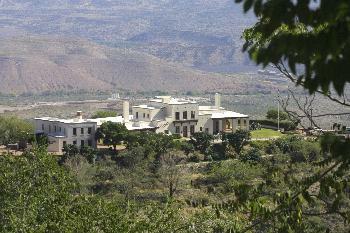 More than twenty years ago, when I first visited the Jerome State Historic Park, the Douglas Mansion, I became fascinated with the historic copper mining camp’s history and the romantic appeal of the late 1890’s. Soon thereafter, I entertained the idea of writing a historical novel set in Jerome during its boom town years in the late 1890s. In 2008, I sent the first twenty pages of that endeavor to ACFW (American Christian Fiction Writers) as an entry in their Genesis contest for unpublished novelists. 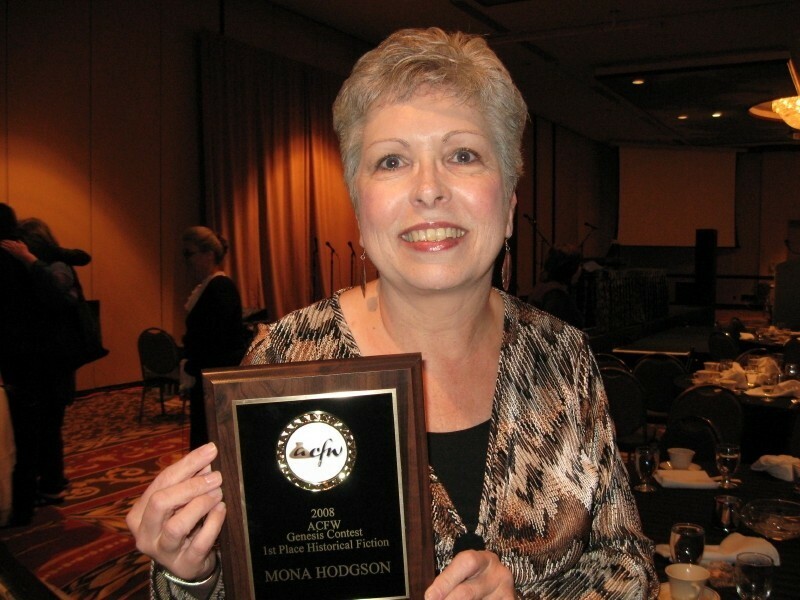 Later that year, my writing sample was awarded First Place in the Historical Fiction category at the annual ACFW conference.March 31, 2009 my agent called and asked if I was sitting down. She’d shown the proposal for the Jerome novel to several editors, and had heard back from one who was interested in publishing me. In an out-of-the-ordinary situation, the editor, the brilliant Shannon Hill Marchese at WaterBrook Press, asked if I’d be willing to adapt my story premise and move it to Cripple Creek, Colorado. Still set in the late 1890’s. Still taking place in a mining camp, but gold instead of copper. Obviously, I said yes. And as they say, the rest is history. In the form of historical fiction. When Shannon suggested a series that included four sisters coming west, she didn’t know, and neither did my agent, that I was one of four sisters. I leapt at the chance to write that story, incorporating a few of the characters and plot points from the Jerome novel. 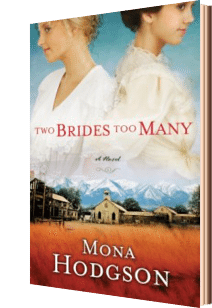 Dr. Morgan Cutshaw, Lewis P. Whibley, and a devastating fire all found their way into Two Brides Too Many, Book One in The Sinclair Sisters of Cripple Creek Series. 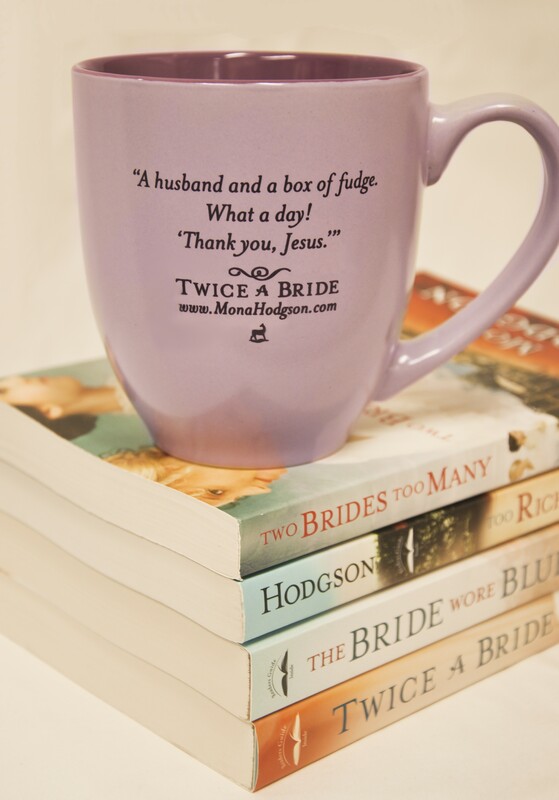 October 2nd, we launched Twice a Bride, the fourth and final book in the series. And… we have another series in the works. I’ll tell you more about that in a future post. So stay tuned! 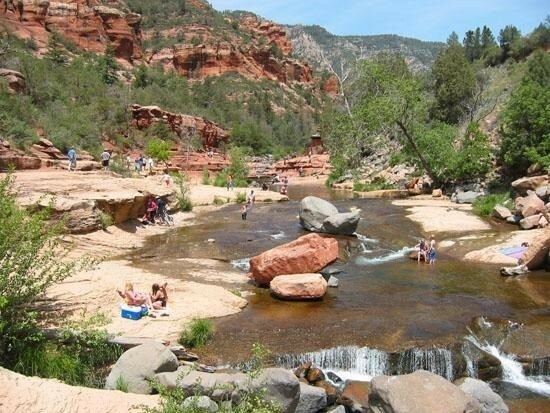 Do you have a favorite destiniation in colorado? 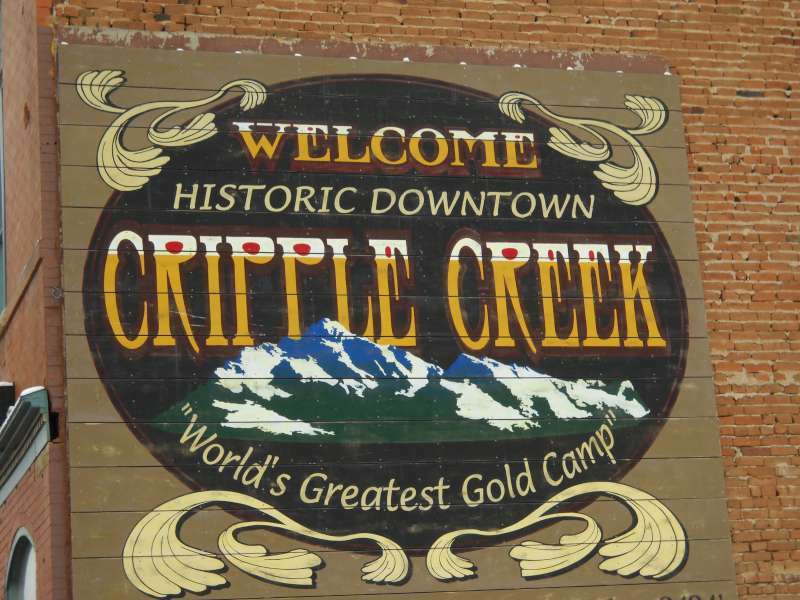 Have you been to Cripple Creek? You may know you can find me on the worldwide web, Twitter, Facebook, Pinterest, GoodReads, the Book Club Network, and here on my Hindsight blog. 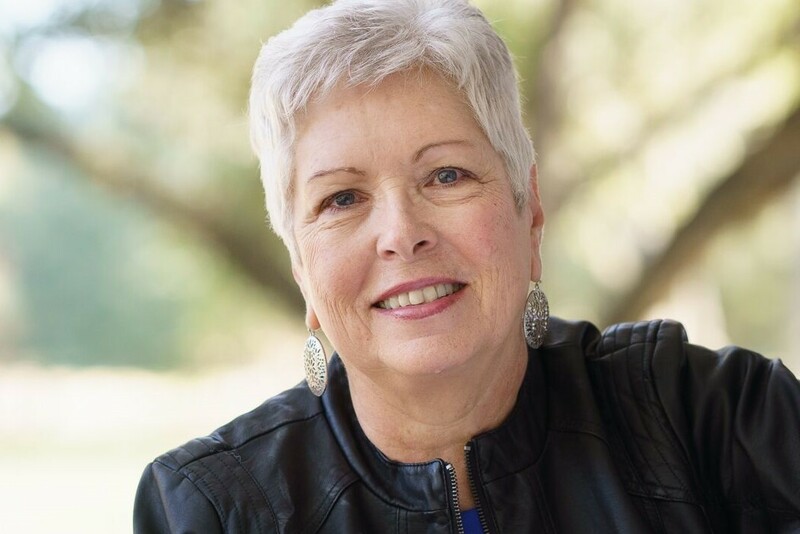 You may even know you can connect with me through my quarterly e-newsletter update, but you may not have thought to look for me at a chuckwagon supper or at a carriage house. 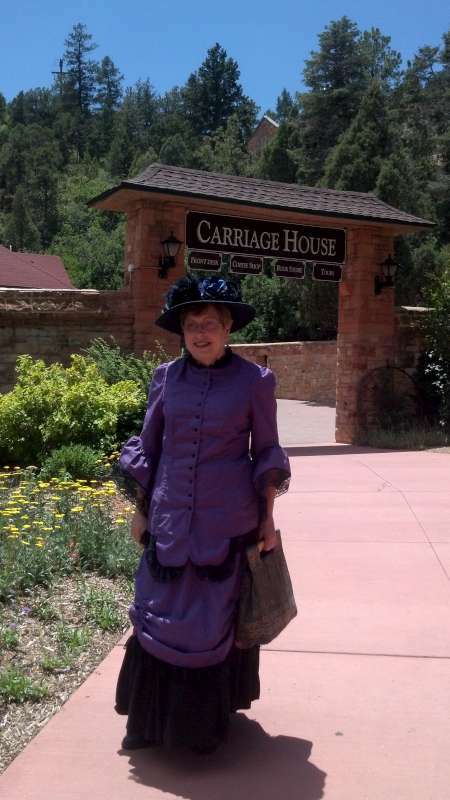 Last month, Bob and I embarked on a Colorado Road Trip Book Tour for The Bride Wore Blue, the third book in The Sinclair Sisters of Cripple Creek Series. Book signings give me the opportunity to connect with bookstore managers and staff as well as with readers. That’s all good! But since I was going to stack a few book signings back-to-back, I tapped my fingertip on my chin and set myself to thinking of ways I could mix it up a bit. I don’t know that you’d necessarily consider my ideas brilliant, but they were definitely fun to instigate. I write western stories set in the 1800’s. Furthermore, my present series is set in the late 1890’s. While I feed stories into my computer, I try to bring my time period and characters to life for my readers. Why not do so during promotional events? That question sent me on a search for period appropriate costumes. Gowns, day dresses, skirts, shirtwaists, petticoats, gloves, boots, and hats. No crinolines, corsets, or bustles for me. That decision saved us the trouble of having to haul around a fainting couch. My sister, Cindy, the “tea party lady,” told me about www.recollections.com and the owner of a cowboy shop in Sedona told my hubby, Bob, about the Wild West Mercantile in Mesa, Arizona. Both were much more reasonably priced than other resources I’d investigated. Several years ago, at Murdoch’s in Montrose, Colorado, I’d found a pair of brown lace-up boots. My sister, Linda, and I both bought a pair. When I bought a purple and black lace Victorian set from the Wild West Mercantile (www.wwmerc.com), I needed a pair of black boots. My hubby Bob found them at a yard sale in the color and size I needed. You can see more about Bob’s yard sale treasure hunts on Pinterest at http://pinterest.com/monahodgson/bob-s-yard-sale-finds. And don’t miss the upcoming post that features Bob’s top tips for yard sale success. I appreciate traditional bookstores and booksellers, and included several in my stops on the book tour. The staff and customers at Mardel Christian Store in Colorado Springs loved the costumes. As I planned this trip and thought about my particular target audience—the readers of historical fiction, I began to brainstorm venues that might hold special appeal for my particular audience. For its western theme, I came up with the Flying W Ranch. The chuckwagon supper and cowboy show was a bonus. 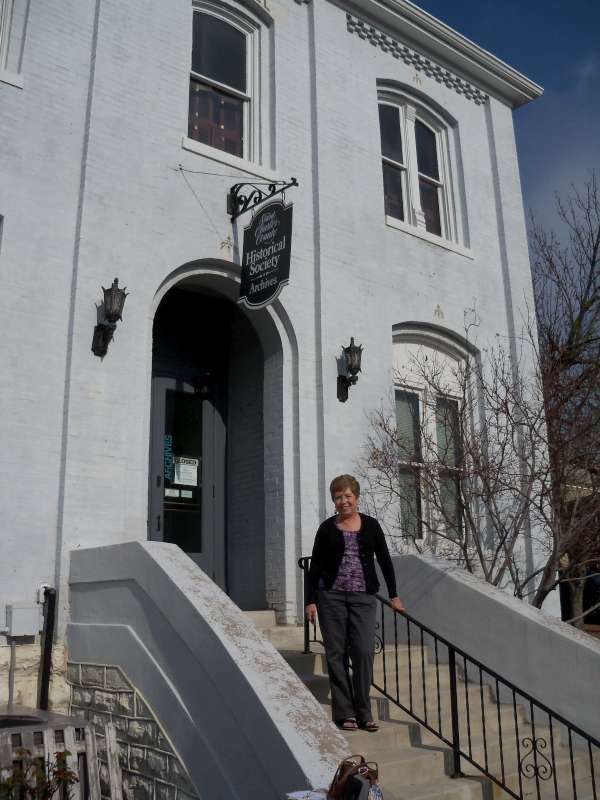 For its historical appeal, the Glen Eyrie Bookstore, which is set in a carriage house. Glen Eyrie is the home of the Navigators and the grounds host many historical markers, including a castle. Both venues provided grist for this historical novelist’s idea mill.I’m making a list for additional pieces I’d like Bob to find for my costume wardrobe and I’m always on the lookout for book signing locations that offer a twist. 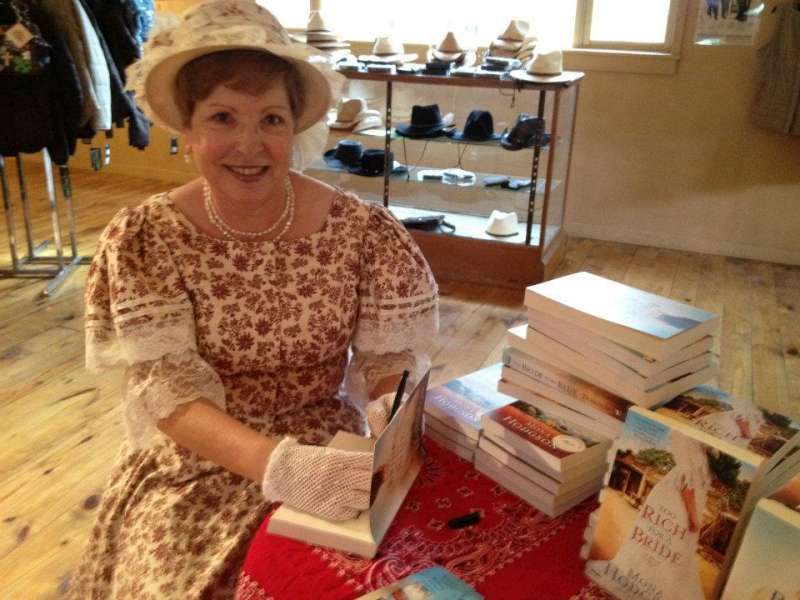 Might you have ideas for out-of-the-ordinary venues for my book signings?Side note: I purchased the calico set from www.recollections.com and the purple and black lace Victorian dress at the Wild West Mercantile in Mesa, Arizona (www.wwmerc.com). 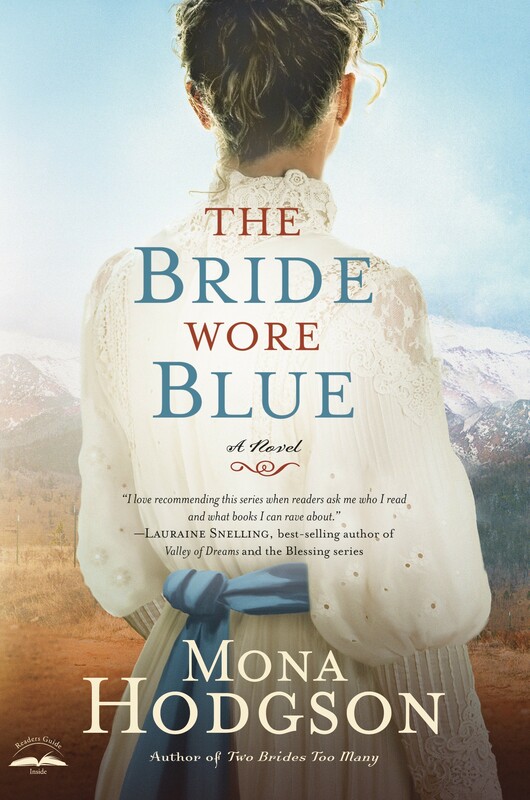 Read Excerpt, The Bride Wore Blue. 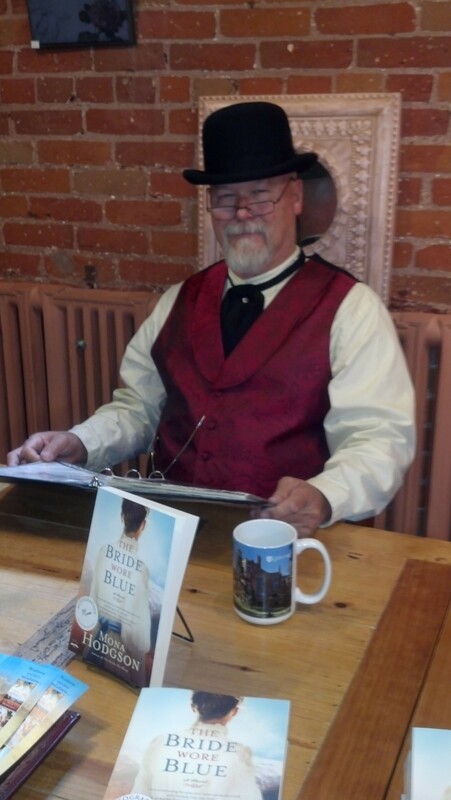 Bob looking dapper for a book signing at Glen Eyrie in Colorado Springs. When the idea of writing for publication first flitted through my mind, my hubby Bob began encouraging me. “Well, you do like to write letters and you’re good at it,” he said. When I approached Bob about my desire to attend a writers’ conference, he began a long haul of personal sacrifice and made a way for me to attend the Mount Hermon Christian Writers’ Conference in 1988. Bob has made sure I had a space for my writing paraphernalia. First, a wall here, or a corner there. Now, I have a dedicated office. Bob taught me how to boot my first computer, cut and paste, and how to load paper into a dot matrix printer. We’ve joked about his job description: “Everything Else.” But it’s no joke. He’s my computer tech, trouble-shooter for anything electronic, and website designer and guru. If I need business cards, flyers, posters, stickers, or address labels, I go to Bob. I’m hearing from fans of The Sinclair Sisters of Cripple Creek books who commend me for the authenticity in my settings and time-period details. Bob is due much of the credit. One, he is a walking database. For instance, the particulars, smells, and sounds of a narrow gauge locomotive. Two, he thrives on research. Everything from hats to photographic plates, and telephone switchboards to surreys. If you enjoy historical fiction, you no doubt thrive on history and research. Good news! Bob’s going to share his wealth of knowledge in “Bob Features” on the blog. He’s taken fun photographs of historical items that he’ll talk about. He’s even shooting videos for us. So, stay tuned! I am now a blogger. What excites me most about the new title is that writing a blog gives me another point of connection with you. Even better, this particular gathering place offers the opportunity to share more on a personal level than is possible on Facebook, Twitter, Pinterest, GoodReads, the Book Club Network, LinkedIn, or even in my quarterly e-Newsletter. 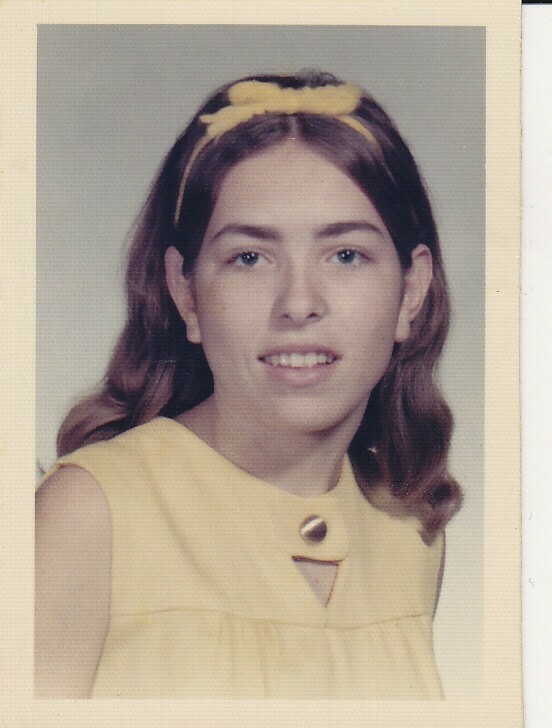 High School, my yellow phase. Given my experience with high school history classes, it’s nothing short of amazing that I write historical fiction. Three memories of high school history class stand out. 1) My most memorable history teacher preferred his role as the basketball and baseball coach. 2) I recall a lot of doodling, which included hearts and arrows and the initials of one or more of the wanna-be jocks who sat in front of me. 3) I remember nodding off every time my teacher chased a basketball or baseball rabbit down a trail. I don’t remember much real “history” being taught. Consequently, I didn’t assign value to much of anything that had occurred in the long-ago. How could the past be important while my present was being shaped by bucket loads of teenage angst? I finished my history studies with a quivering C, doing so on an auto-pilot that annulled most historical names, facts, and dates upon my high school graduation. Then I met and married Bob Hodgson. He’d had a high school teacher dedicated to demonstrating the relevance of history. Bob thrived on anything related to science and history. Proof, opposites do attract. Somewhere along the way, history began tickling my subconscious. Bob’s enthusiasm for history swayed me, I’m sure. So did the wistfulness and wonder that came with maturity. My interest in historical fiction grew as I pondered places and circumstances foreign to me. As I wrote nonfiction for adults and fiction for children, my curiosity took on a magnetism that pulled me into the 1800’s. I had to know more about history. Today, I’m the one most eager to peruse history books, visit museums, and ponder archives. I’m now the author of four historical novels in The Sinclair Sisters of Cripple Creek Series and two historical novellas. A mind-boggling fact that points to truth. Beyond our wildest imaginings, dreams, and abilities, God has a plan for you and I (Jeremiah 29:11). Hindsight is about observation, retrospection, and perception after the fact. Thus, the name and focus of my blog. I welcome your comments and suggestions as we connect on a more regular basis through Hindsight.